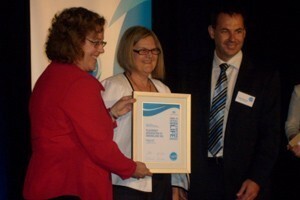 A Queensland Not for Profit has won a National Work-Life Balance Award sponsored by the Federal Government. Not for Profit, Playgroup Queensland has won the National Community Sector Work-Life Balance Award sponsored by the Federal Government. The Awards recognise businesses and government and community organisations that are leading the way in delivering policies, practices and initiatives that help people balance their work and family commitments. Senator Jacinta Collins, Special Adviser on Work and Family Balance and Pay Equity, presented Playgroup Queensland with the Community Sector Work-Life Balance Award. The Awards, announced at Old Parliament House in Canberra, recognise family friendly practices like flexible working hours, options for working from home, paid parental leave, job sharing, onsite carer’s facilities and study assistance. This initiative is one of the measures under the Government’s Fresh Ideas for Work and Family policy commitment. Research shows that flexible working arrangements help businesses retain valuable staff, minimise turnover costs and boost productivity, staff morale and customer satisfaction. Playgroup Queensland says that as an organisation that promotes a family friendly workplace, and strives to maintain work-life balance throughout its State-wide offices, it is thrilled to be recognised for this prestigious Award. Playgroup Queensland says it demonstrates its corporate values by employing people from a diverse range of professional, cultural and social backgrounds, many of whom are also parents. Playgroup Queensland offers flexible rostering, paid parenting leave, work-from-home options, information technology advances, job-sharing arrangements and welcoming children at work are initiatives which it says have led to substantial productivity gains for Playgroup Queensland, helping it to become an employer of choice. This year’s National Work–Life Balance Awards winners were selected by a Judging Panel that included representatives from Diversity Council Australia, the Australian Chamber of Commerce and Industry, the Business Council of Australia, the Australian Council of Trade Unions and the Centre for Work + Life (University of South Australia).